The movie division of Marvel Comics, having exhausted its roster of AAA heroes, has begun moving into lesser known titles. This change started last summer with the release of Guardians of the Galaxy. Ant-Man is the latest Marvel superhero property to get the big screen treatment, and it's a welcome addition to the franchise. It's character driven, has plenty of humor, and has no apocalyptic pretenses. It's almost a throwback to the style of action films that were made 10 to 15 years ago. If not for an extended sequence set at an Avengers safe house, Ant-Man would stand entirely on its own. Ant-Man follows the travails of Scott Lang. Played by Paul Rudd, Lang is former electrical engineer and current master thief. With his surprisingly multi-ethnic gang of crooks, which include characters portrayed by Michael Peña and rapper TI, Lang rips off a fancy neo-Victorian home in San Francisco. It turns out that this home is owned by famous and wealthy inventor Hank Pym. Pym is portrayed by Michael Douglas and was formerly known as Ant-Man before he became a recluse. Sensing potential in Lang, Pym offers him the opportunity to save the world as a new incarnation of Ant-Man. It turns out that company Pym founded years ago, now known as Cross Technology, is scheduled to unveil a new weapon based on his shrinking technology. Pym vowed to keep his technology from being weaponized, and Scott just might be the man to break into their headquarters to steal prototypes. 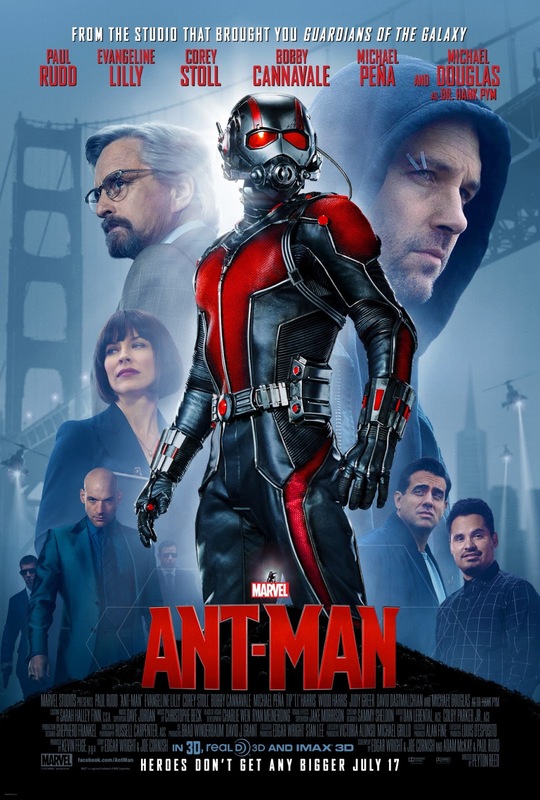 Ant-Man's powers are granted by a high tech suit, and these powers include shrinking in size and controlling ants. There are plenty of creative ways to depict Ant-Man's powers, and director Payton Reed and crew create unique, fun set pieces. Overall, Ant-Man is a fairly lighthearted affair. Though there is some thematic asides made about fathers and daughters, nothing is particularly bleak. Michael Douglas handles most of the film's melodrama, while Rudd and his crew fall into a long line of bumbling crooks that stretches back to the Three Stooges. Evangeline Lilly stars as Pym's daughter, and Corey Stoll plays the maniacal leader of Cross Technology. It's obvious that Marvel Comics Universe ®℠ movies are not going anywhere. It's nice that Disney and Marvel have expanded to new properties and new stories, rather than rebooting the main Avengers. Ant-Man is a fun, light romp, and hopefully Marvel continues to bet on new heroes.